Traditional Italian cookies, I know. Disclaimer: I’m not an expert. That designation goes to my family of Italian grandmothers, aunts, uncles, cousins, mom, and dad. When it comes to traditional Jewish cookies, I only know what tastes good! When I was growing up, I delighted in the extra-special Italian cookies made for all the big (and not-so-big) celebrations. All the fancy, intricate, and delicious cookies appeared at weddings, graduations, baptisms, and baby showers. The process of making those cookies was an event itself. Women in the family would gather to make huge batches of goodies, and they had the process down like an assembly line. You’ll find these Pumpkin and Walnut Rugelach Cookies fit the bill when it comes to “special occasion” cookies. I’m sure there are more family recipes for rugelach than you can count, but I came across one I was eager to make. It’s from the beautiful cookbook, The Community Table: Recipes & Stories from the Jewish Community Center in Manhattan and Beyond. This book is filled with modern and classic Jewish recipes with international flair. The recipes were gathered from members of the JCC Manhattan and are diverse and flavorful. I can’t wait to work my way through this book! I slightly adapted Pumpkin and Walnut Rugelach Cookies from the book’s recipe. The recipe I followed from the book gave me way too much filling, so I tried again with different portions and adding the walnut-sugar mixture. I even went a little rogue when it came to cutting and shaping the cookies. The dough for these cookies is delicious, but it’s very soft and very sticky, and requires refrigeration before working with it. The recipe called for cutting the 9-inch disks into 16 wedges. For my first batch, I followed the directions, but found the dough to be really hard to shape. Maybe it takes practice but I finally decided to slice fewer wedges, and that gave me small, medium, and even a few large cookies. The small Pumpkin and Walnut Rugelach Cookies were adorable and button-like, but no matter the size, they were all delicious (yes, I sampled each size, just to be sure). 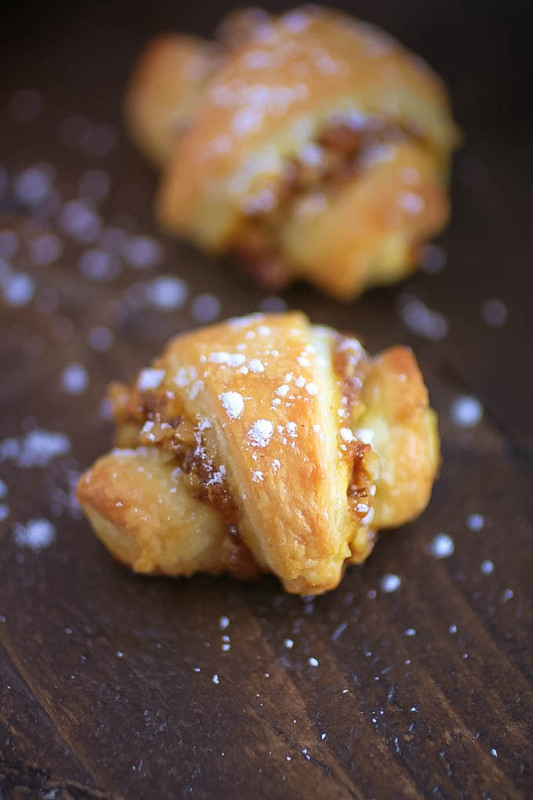 I hope you’ll consider trying your hand at making Pumpkin and Walnut Rugelach Cookies for any celebration. They’re a delight! These special occasion cookies are rich and delightful. Perfect for a celebration! Add the flour, butter, cream cheese, and sour cream into a stand mixer (you could also use a food processor with a metal blade). Blend or pulse on medium until combined. Sprinkle the sugar over the mixture and blend or pulse again until combined. The dough with be soft and sticky. Divide it into four equal parts. Pat it flat into a disk and wrap it in plastic wrap. Refrigerate for 2 hours. Add the pumpkin, apple juice, 1/3 cup sugar, 1/2 teaspoon cinnamon, nutmeg, allspice, and salt into a saucepan over medium-high heat. Stir until combined. Bring the mixture to a boil, then reduce the heat. Simmer the mixture for 30 minutes, stirring occasionally. Taste and adjust the seasoning as needed. The mixture should be thick and spreadable when finished. Remove the dough from the refrigerator and let it stand for about 10 minutes. Combine the walnuts, remaining sugar, remaining cinnamon, and brown sugar. Preheat the oven to 375 degrees F. Line a baking sheet with lightly floured parchment paper. Set aside. One at a time, place a portion of the dough between two sheets of parchment paper. Roll out the dough to form a 9-inch circle, about 1/8-inch thick. Chill in the refrigerator for about 15 minutes. Remove the top piece of parchment paper. Spread 1/4 of the pumpkin mixture evenly across the circle, leaving a 1/4-inch border around the edge of the dough. Sprinkle 1/4 of the walnut mixture over the top. Use a sharp knife to slice the circle into 12 wedges, or so. One at a time, remove the wedges and, starting with the widest portion, roll it toward the pointed portion. Tuck the tip underneath the cookie and place on the baking sheet, leaving 1-inch between each cookie. Cool completely and sprinkle with the confectioners’ sugar before serving. They would hit the spot, for sure! Thank you, Alice! I love rugelach!! This combo sounds so delicious!! Never heard of these cookies before, they look darn good. My first time making them -- they're so good! Thanks, Candy! 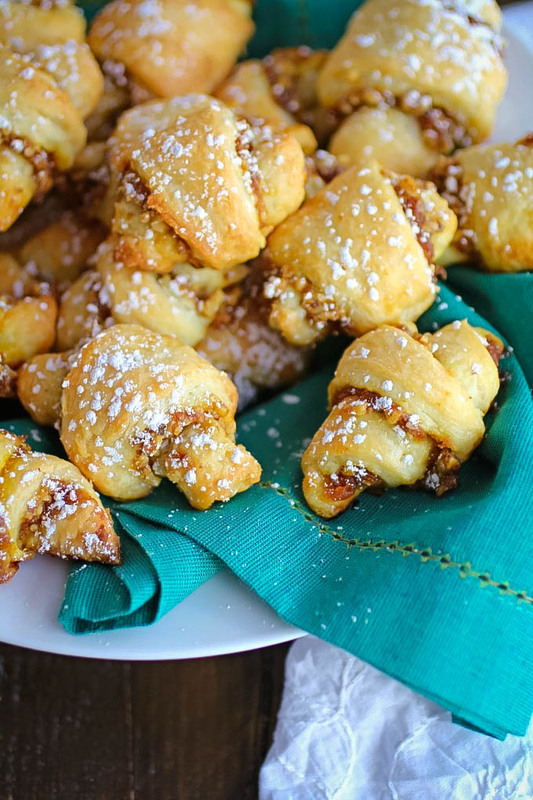 My kids just love chocolate rugelach and now if I make these, they will be so excited. They're so perfect for pumpkin baking season!!! Oh that's awesome! Thanks, Lora! These cookies look special enough for a cookie tray oreveryday cookie jar. Thanks for the heads up about working with the dough in smaller proportions. Thanks! They weren't hard to make, and like I said, even easier if you make the portions bigger! Um, yes, you hit that on the head! :) Thanks, Clarissa! These look absolutely delicious! GREAT recipe!! Thanks for your kind words, Amber! I have never tried rugelach cookies but these look heavenly! Thanks, Des! My first time making them -- yum!! I've been craving rugelach, Patricia, and your recipe looks like a great twist on the usual. Thanks for sharing! Thanks, Jill! I hope you give them a try - so yummy! No - not hard at all (although I thought they would be)! Thanks, Joanna! 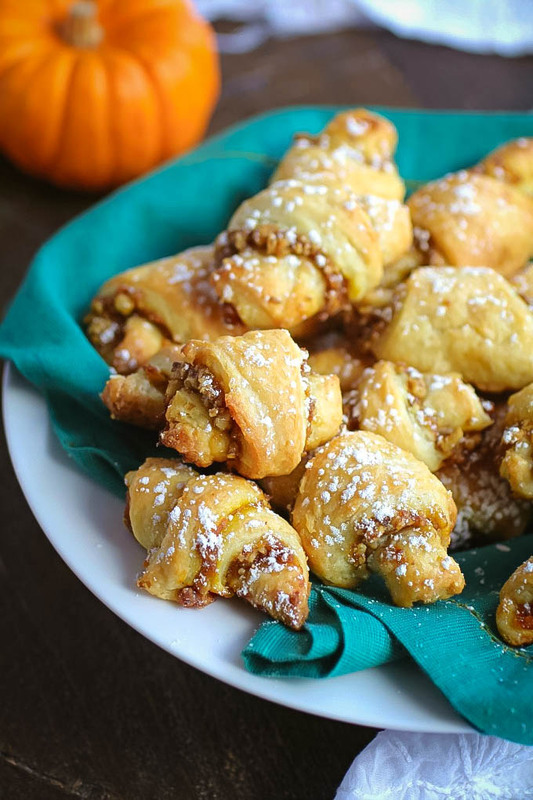 Wow, these pumpkin walnut rugelach cookies look so delicious! I will have to try this recipe this Fall! Thank you for sharing your recipe! Thanks, Ashleigh! Hope you give them a try soon! What a terrific Fall treat, I love these flavors! These cookies sound so delicious! What a yummy treat! Wow! These cookies are so special! :) I love how cute they are!! Thanks so much! They are cute (and delish)! Yummy. I'm looking for new pumpkin recipes and these look perfect for the fall. For sure! These are great for the season. Thanks, Jenine! Ohhh, I saw these cookies on pinterest earlier today. They really caught my eye and sound fantastic with pumpkin and fall flavors. I have to make them. Thanks so much, Ginny! They're so tasty! Hope you try them! WOW!! These cookies look absolutely delicious!! Can't wait to try them! Thanks so much, Katerina! Hope you love them! These cookies are perfect special occasion cookies -- sounds absolutely delicious! The are, Sheila! Thanks for stopping by! My goodness I love the dough recipe! YUM. These look so good. I must try to make rugelach again. 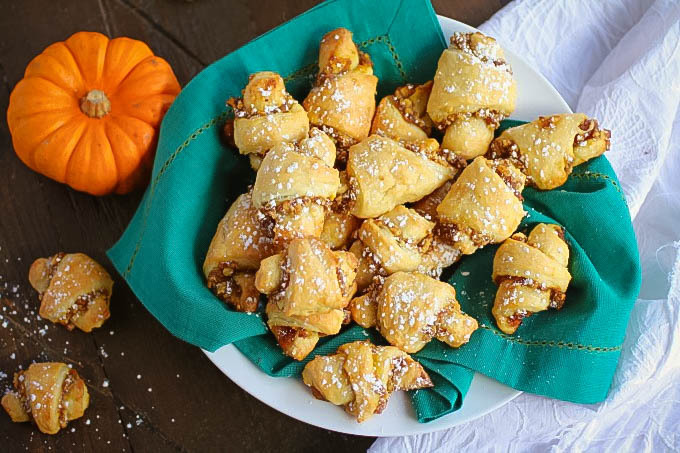 Rugelach are some of my favorite cookies to make but I've never thought of adding pumpkin - this is genius! I'm drooling just looking at it. I can't wait to try this. Thank you for sharing. Wow, a great little recipe. Perfect for fall. Pumpkin flavor is so great for this season. i would love if you shared this at our link party today, Dishing It & Digging It. The party is live at 4:00 EST. These look so perfect! Have never heard of them before but definitely want to try! They're really good! Thanks, Ashlyn! THANK YOU so much for this wonderful recipe; our SamsClub used to make these for sale during the Thanksgiving/Christmas holidays but they have not made them for the past few years. Our family loved these cookies and I have not found a recipe that actually listed pumpkin in the filling. I'm on my way to the grocer now to pick up the ingredients that I don't have. Baking to follow soon. Mmmm.... I can almost smell them already!! I don't understand.....where's the pumpkin?? There is 1/2 cup pumpkin puree in this recipe - Under "Filling" - first ingredient on the list. Thanks! These look more like pastries rather than cookies to me, but either way they look delicious! I love the combo of pumpkin and walnuts! Yes, that's one way to look at them! They're tasty! Thanks, Brittany! So many tasty flavors, such a yummy treat! My mother-in-law makes cookies just like this for Hannukah. So yummy! They are so tasty! Thanks for stopping by, Amanda! I just saw these cookies on TV. I need to make these ASAP. They're really nice! Enjoy, Luci! I've never tried these before, but I'm adding them to my holiday baking list! They look so pretty and sound delicious! Thanks, Maegan! They're great or the holidays! These look delicious! Can't wait to try!